NICE has accredited the process used by the National Osteoporosis Guideline Group to produce Clinical guideline for the prevention and treatment of osteoporosis. Accreditation is valid for 5 years from 7 March 2017. Provide intervention thresholds i.e. 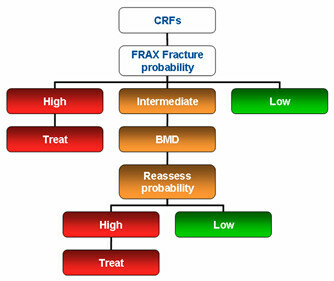 fracture probabilities at which treatment is recommended. This updated NOGG Guideline has been produced with the support of the Bone Research Society, British Geriatric Society, British Orthopaedic Association, British Orthopaedic Research Society, International Osteoporosis Foundation, Primary Care Rheumatology Society, Royal Pharmaceutical Society, Society of Endocrinology, National Osteoporosis Society, Osteoporosis 2000 and Osteoporosis Dorset. The Guideline has also been endorsed by the Royal College of General Practitioners.